Ever need a dessert to bring to a party or gathering that is no bake, takes 5 minutes to whip up, and is guaranteed to delight everyone? 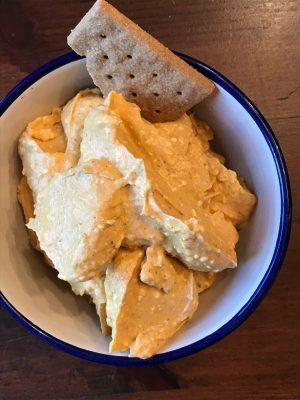 Well here it is… Pumpkin Pie Dip. Dig in with a cookie, graham cracker or apple slice, it is delicious! Tastes like pumpkin cheese cake without all the work. Allow the cream cheese soften by letting it rest until it reaches room temperature. Cream together cream cheese, and pumpkin pie spice, blend with a mixer until smooth and fluffy. Add 1/2 cup of the powdered sugar, vanilla, and blend together well. Blend in the remaining powdered sugar. This is best if it rests for an hour or two to allow the flavors to mingle together. 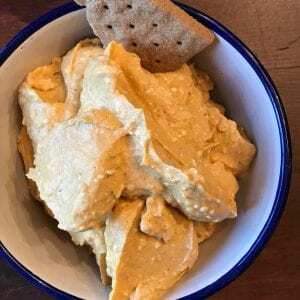 Serve with gingersnap cookies, apples, or graham crackers. You could also experiment with substituting some of the cream cheese for plain Greek yogurt or frozen whipped topping. At what point do you add the pumpkin puree? With the cream cheese? Or with the powdered sugar? It’s in the ingredients list but not the recipe. Thanks! I always appreciate gluten-free options. This sounds delicious! wow good catch on that missing piece! Mix the pumpkin pie puree, cream cheese and spice blend together. Then add powdered sugar. It is delicious! I hope you love it!